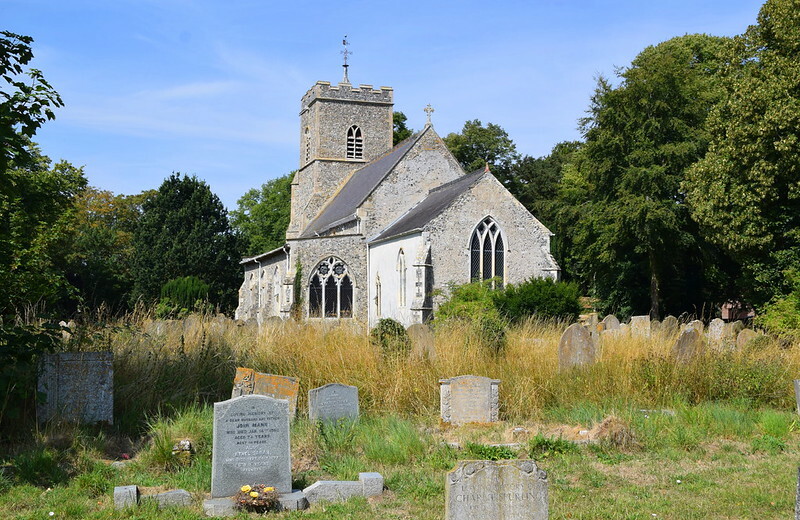 This is a strong, handsome church in a pretty village, one of several with unusual names in the fertile, rolling landscape between Diss and Attleborough. 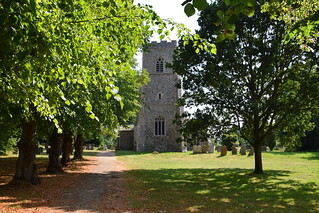 After the Conquest, this area was covered by a vast hunting forest, and even today it is possible to stand on the rise of the churchyard and imagine the treetops spreading to the horizon. If you have a vivid imagination, you might populate the woodlands with argumentative knights and pilgrims, for the parish was the subject of a great medieval legend, the Sword of Winfarthing. It was said that one knight killed another in a dispute over a woman, and sought refuge in the church. No doubt he claimed Benefit of Clergy (meaning, simply, that he could read and write) and was allowed to flee into exile. Today, the sword is itself lost, gone astray like so much else in the holocaust of the Reformation. But what became of it? Perhaps it was melted down. 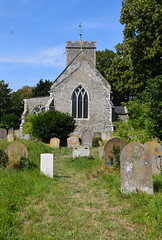 Or perhaps it was buried, and it still lies under the ground somewhere in the fields of south Norfolk. Just like tourism today, pilgrimage brought prosperity to a parish, and this may explain why St Mary underwent a fairly sumptuous rebuild in the early 14th century. 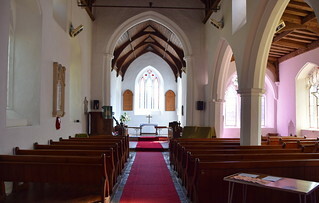 The nave is rather striking, the larger Decorated windows and the quatrefoil windows of the clerestory seeming to alternate. The late Middle Ages and the 19th century brought further refurbishment and refinement, leaving us with a crisp, comfortable interior that is lighter than it might have been, given the economy of the windows. The most striking feature of the interior is the huge, tublike font, which sits at the west end. 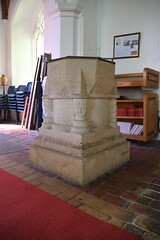 It actually appears to be parts of two separate fonts joined together, and Pevsner thought the octagonal top part was probably a Victorian addition to the Norman stem. Whatever, the most interesting thing about it is the pair of faces on the eastern pillars of the base. 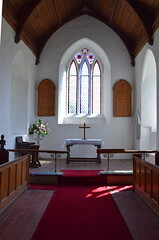 There is a collection of medieval glass fragments compiled into two roundels in the upper lights of the east window, but otherwise the sanctuary is spare and simple. 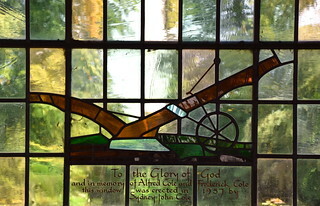 There are two slightly unusual memorials. 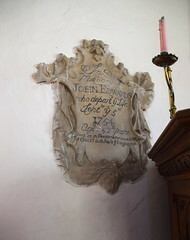 The 1754 wall monument to John Edwards appears to have been inscribed by an unskilled, amateur hand; and yet the moulding of the plaque itself is very good, and surely must have been bought off-the-shelf from a skilled stonemason. 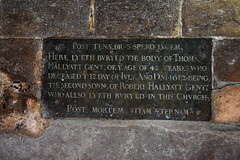 A brass plate of 1612 at the west end reveals puritan sentiments in its Latin inscriptions: Post Tenaebras Spero Lucem it says, and Post Mortem Vitam Aeternam: 'After Shadows I Hope for Light', and 'After Death the Life Eternal'. 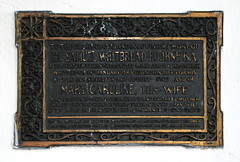 Two hundred and fifty years later, a pressed bronze plaque remembers Samuel Whitbread Bourne, the devoted minister of this parish who died giving his life for his people in a fearless act of duty. Bourne had contracted smallpox while visiting a parishioner. Unlike Bourne, the man recovered and lived for another sixty years. 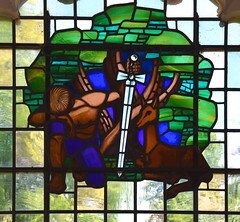 In the north side of the chancel a 1957 window by Brian Fielden for King & Son depicts a plough, a stag, and the Sword of Winfarthing.